Collector's Edition with 4 long deleted albums and MCDs plus 8 rare and unreleased songs. 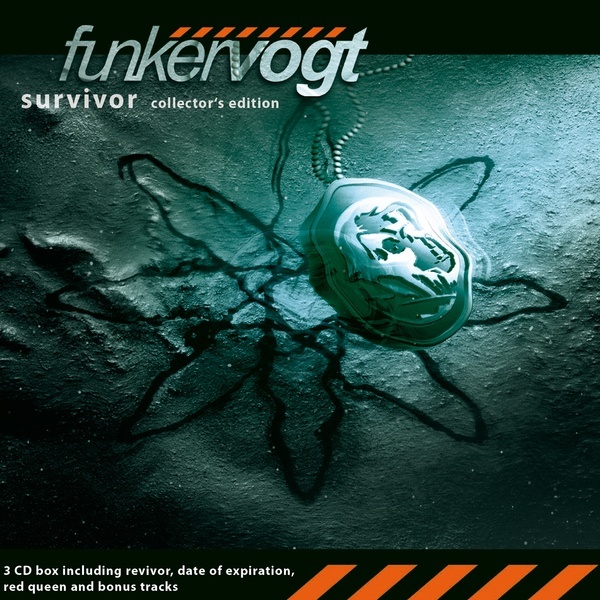 Survivor is one of the most important releases by the cult band Funker Vogt, and finally it is available again on CD. The Collector's Edition comes in a 3CD digipak, containing the following releases: Survivor, Revivor, Date of Expiration, Red Queen (feat. Joke Jay of And One) plus various bonus material, rare and unreleased tracks. Completed by a detailed booklet with all original artworks and for the first time including all lyrics. Altogether 42 tracks on this 3 CD Collector's Edition, presenting everything a fan would ask for. Especially for new and younger fans of Funker Vogt this is a good chance to complete their collection. Here they will find the classic club-hits like „Date of Expiration“, „Final Thrill“ and „History“ which are still present in the current playlists of DJs and which are still played live at the Funker Vogt concerts. Moreover this Collector’s Edition contains extremely rare tracks like "Refugees", "Whenever a Child dies" and the B-sides "Second World", "Chessmen's Square" and "Traumatic Event". The aforementioned track can also be found as a remix by the famous GOA-expert DJ-Bim. For the first time, the listener will get a view behind the scenes and can discover the evolution of a song from the very first demo-edit (Fallen Man, Final Thrill) towards the final version. And as if this is not already enough, the Revivor CD presents the interpretation of the Survivor songs by famous scene acts as ICON OF COIL, DANCE OR DIE, HAUJOBB, AGHAST VIEW, XPQ-21 or T.O.Y.